Create branded CTAs for your content. Grow your email subscribers in a beautiful way. Customize your button to fit the aesthetics and brand of your site or your blog post. Once you’ve created your button, simply copy the embed code and paste to the desired location of your webpage. Track your Treck button’s performance. See which button produces the most leads to better design your marketing strategy. Your Treck buttons will help you grow a valuable lead list. Using Insights, you can promote well-performing content to more viewers. Treck connects to your favorite email service providers and CRMs (mailchimp, sendgrid, etc.) to sync your leads right to your mailing list. As a subscriber, create endless variations of buttons using different branding and CTA language based on the needs of your marketing content. Treck is free to use. Please use our chat tool in the lower right-hand corner if you don’t see your question below. How many call-to-action can I create? 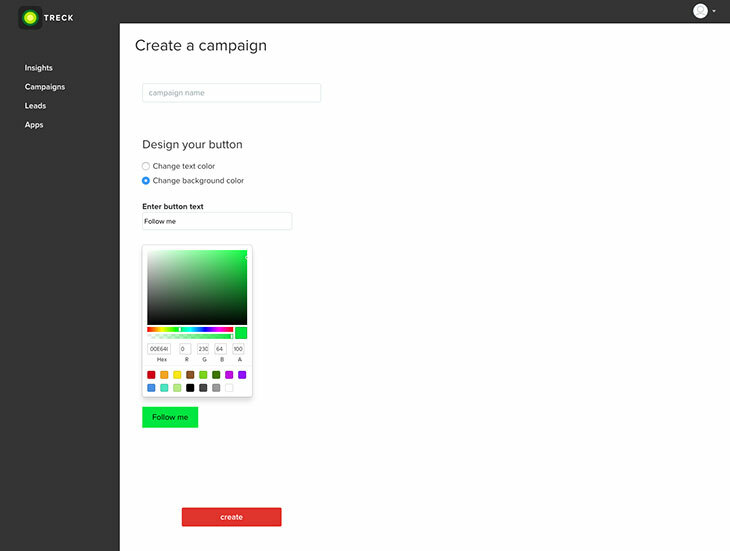 You can create an unlimited number of buttons with Treck with various calls-to-action. Where can I place my Treck button? You can embed your buttons anywhere you’d like! Buttons work great on homepages alongside an offer, at the ends of articles, to unlock exclusive content, to claim a discount, to capture quiz-taker information, or on the sides of a blog to capture more subscribers. The opportunities are really limitless. How do I get access to my leads? You can view your leads in the dashboard of your Treck portal along with your insights. What information do you collect from a lead? We collect their name, email and location. You can access this within your dashboard.